Since I was a little girl I’ve loved fishing. There’s just something about being by the water, holding a fishing pole, watching the red and white bobber, and waiting in anticipation that gives me such excitement! But I don’t care to fish from a boat. I don’t swim well, and being in a boat sort of makes me uneasy. I’m far more at ease being on the banks, able to move around, and feeling that good solid earth under my feet. The other day my husband and I went fishing. This was a real treat since it was only the second time all year we’ve had time to go. As I stood there, this time fishing on the bottom and trying to feel the fish bite from my line, the waves were ripping! The wind defeating me every time, pushing against my line and removing the tension I’d had in it. It was then that the words of the disciples from Mark 4:41 came to me when they said “even the winds and the sea obey Him”. They learned this not through Jesus preaching to them, not by explaining to them how He controls the waves, nor by revealing the chain of command of the elements under His feet. They learned His authority over the wind and waves by Him showing them in an example they would never forget. Jesus had been teaching a large group of people along the shoreline from the boat. But when it began to get dark He told them to cross over to the other side. In fact, Jesus said “Let US cross over to the other side”, telling them His very intent for the future. Jesus then took a nap in the front of the boat. And then the windstorm came. And then the giant waves came. And then the boat began to fill with water! Where was Jesus? He was still asleep - asleep in the FRONT of the boat. 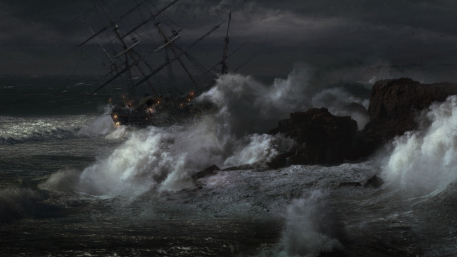 One of the lessons I’ve learned on a boat, thanks to my brother, is never – ever – be in one when there’s a storm! The other is to stay in the back when the water is rough because the front of the boat takes the hit of the waves first. I think Jesus purposefully placed Himself in the front of the boat to be an example to the disciples. What was the example? His statements when they woke Him say it all. He stood up, spoke to the wind and the sea and said two things. First He said to the wind and the sea, “Peace, be still.” Whenever we are in a fearful condition, we need to be able to remain calm, and take control of our fear. Having lived in fear for years after being mugged, I can tell you the only way to overcome it is to control it, and the only way to control it is to remain calm, and control your mind. The more you allow fear to enter into your mind, the more it will control you. As Christians we are to take every thought captive (2 Corinthians 10:5). That means we control them. We harness them, we cuff them, and we decide how long they stay in our minds. We do not fear what we control. The disciples were looking at the waves and the water rushing into the boat. In their minds they had thoughts of drowning, of death. What they’d overlooked was the one controlling it in the front of the boat. The second thing He said was directly to them, and spoke to the root of the problem. He said “Why are you so fearful? How is it that you have no faith?” He didn’t say “that you have just a little faith”. He said “that you have NO faith”. To have faith you have to have an understanding of who Jesus is. When you know Him, you know His power and His care for you. You trust that all things – fearful or not – are in His control. The disciples admitted their lack faith when they said “WHO can this be, that even the wind and the sea obey Him!” Faith is the antibiotic for fear. Where there is faith, there is knowledge and understanding of the power of God, who is in control of all things. Where there is faith, there is trust in God. Where there is faith, fear dies.